Did you get a Ukulele for Christmas, and don’t know where to start? Do you want to strum along with your favourite songs, but end up sounding like a cat stuck in a well? 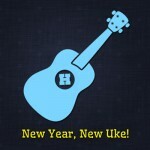 New Year, New Uke is a workshop for absolute beginners. Just bring along your uke and we’ll get you started! Tuning up: How to get your uke in tune, and make it stay in tune! Your first chords: We’ll show you how to play four simple chords, and master the tricky changes between them. We’ll show you some classic progressions which you’ll find in loads of pop, folk and jazz songs. Strumming: We’ll learn some simple strumming patterns to introduce variety and texture to your playing. Resources: There are hundreds of great resources on the web for learning ukulele and new songs. We’ll introduce you to some of our favourites and how to get the best from them. The workshop runs from 11am till 4pm, with a break for lunch. Each participant will receive a printed workbook covering all the main workshop points, and a pdf link to it.